The John Deere Enterprise Disaster Support Program is dedicated to providing support to Deere equipment dealers in times of crisis. 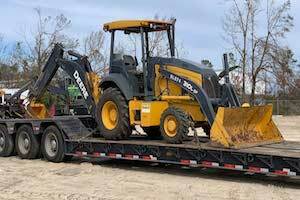 John Deere has revealed that following the destruction left behind by Hurricane Michael, it teamed up with Beard Equipment to donate the use of a John Deere backhoe to four areas in the Florida Panhandle. Lynn Haven, Callaway, and Mexico Beach received a 310L backhoe and Jackson County received a 310SL for use, free of charge for six months. All of these counties experienced serious damage as a result of the hurricane, which made landfall as a Category 4 storm. Hurricane Michael left behind limited access to power, water, and roadways. The free rental is a part of the John Deere Enterprise Disaster Support Program. This program is dedicated to providing financial support for Deere equipment dealers in the form of rental subsidies, depreciation compensation, demonstration discounts or similar funding. "John Deere offers this program to help our dealers quickly respond to disasters," said Nate Clark, the manager of enterprise citizenship at Deere & Company. "The program brings together John Deere, dealers, customers, and nonprofit or governmental organizations when disasters strike, putting John Deere equipment to good use." To learn more about John Deere and its services, visit www.JohnDeere.com or contact your local John Deere dealer.